Broccoli cheddar soup, bread, salad. Broccoli cheese soup is the perfect thing to make when it's cold outside, and you want to warm up, both inside and out. 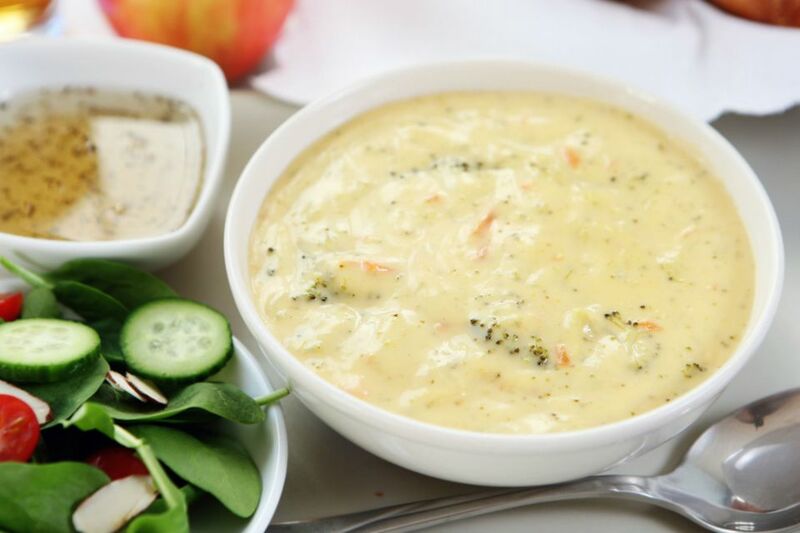 Broccoli and cheddar cheese go well together in almost any recipe, but this broccoli cheddar soup recipe is a particularly nice way to introduce kids to broccoli. To save time chopping, buy the bagged, pre-chopped broccoli available in your supermarket produce section. Heat butter in a large saucepan or Dutch oven over medium heat. Add onions and saute 3 to 5 minutes, until softened. Sprinkle flour mixture evenly over onions and stir vigorously, 2 to 3 minutes, until no lumps appear and raw flour taste is cooked off. Add the half and half and vegetable broth. Bring to a boil, then reduce heat to medium-low and simmer 15 to 20 minutes. Add the broccoli and carrots. Cook 15 to 20 minutes until vegetables are tender when pierced with a fork. Add salt, pepper, hot sauce and cheese. Stir until cheese is melted.